TV with Thinus: The Daily Show with Trevor Noah set to start on Comedy Central on DStv on 29 September at 21:00 in South Africa. The Daily Show with Trevor Noah set to start on Comedy Central on DStv on 29 September at 21:00 in South Africa. When South African comedian Trevor Noah takes over from Jon Stewart on 28 September as new host of The Daily Show, episodes will be broadcast on Comedy Central (DStv 122) on DStv on the African channel feed a day later from 29 September. Viacom International Media Networks Africa (VIMN Africa) which runs Comedy Central Africa says Trevor Noah's first The Daily Show will be broadcast on Tuesday 29 September at 21:00 in South Africa and the rest of Africa. After that a new episode of The Daily Show with Trevor Noah will be shown Mondays to Fridays at 21:00 on Comedy Central. It means that South African viewers will be able to follow the show and its topical discussions, interviews and jokes less than 24 hours after an episode is shown in America. "Trevor Noah's inauguration as The Daily Show host is going to be one of the biggest moments in South African television history, with the whole nation making a date to see this huge local talent make his debut as host," says Evert van der Veer, the head of Comedy Central Africa. Jon Stewart last month announced that he will depart with his last show on 6 August after 16 years of hosting. It incorrectly led to erroneous reports that Trevor Noah would be taking over on 7 August, not keeping in mind the hiatus between seasons and that the new American TV season only kicks off in mid to late September. The 28 September starting date gives Trevor Noah less than two months to put together his type of The Daily Show. Meanwhile anticipation and speculation is also building that Trevor Noah might be announced as the host of the 2015 MTV Africa Music Awards (2015 MAMAs) taking place in Durban on 18 July since MTV Base which will broadcast the awards ceremony live is a sister channel of Comedy Central. Not only is the theme of the 2015 MAMAs "Evolution" - something playing perfectly into Trevor Noah's professional career transition to Comedy Central - but hosting the 5th edition of the African music awards show will put him in front of million of viewers on MTV Base in an unrivaled marketing opportunity shortly before VIMN Africa will want viewers to tune in regularly to Comedy Central from September. 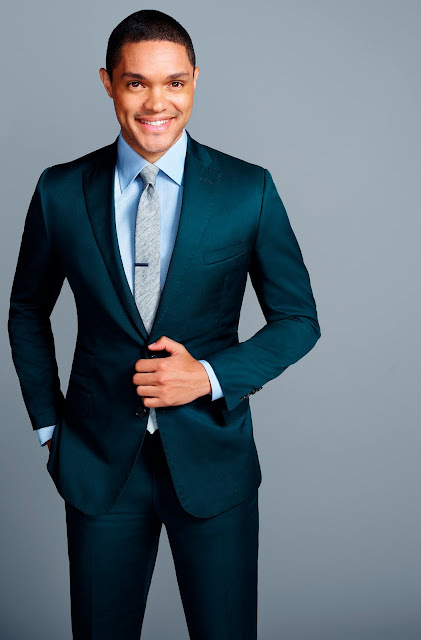 It will presumably also be slightly easier for VIMN Africa to acquire Trevor Noah's buy-in for the 2015 MAMAs hosting gig since as talent he's already inside the Viacom corporate fold.